"My 14-year-old son has experienced so much pain and trauma in the past 2 months. I still can't forget the first time he threw up blood. He was lying down when he suddenly started bleeding through the nose, I was terrified and I went out to call my neighbor, when I came back, there was a pool of blood in his bed. He began to throw up blood and it has not stopped until now. Even his stools are full of blood. I don't know how we both are surviving after all this. How much can we bear?" - Devi, mother. Dasari Dharmateja fell sick often from childhood but his mother, Devi believed it was because he does not eat healthy; After all, they struggle for even 2 square meals a day. She took him to the hospital when he was 10 years old. His stomach was swollen and hardened for a week. 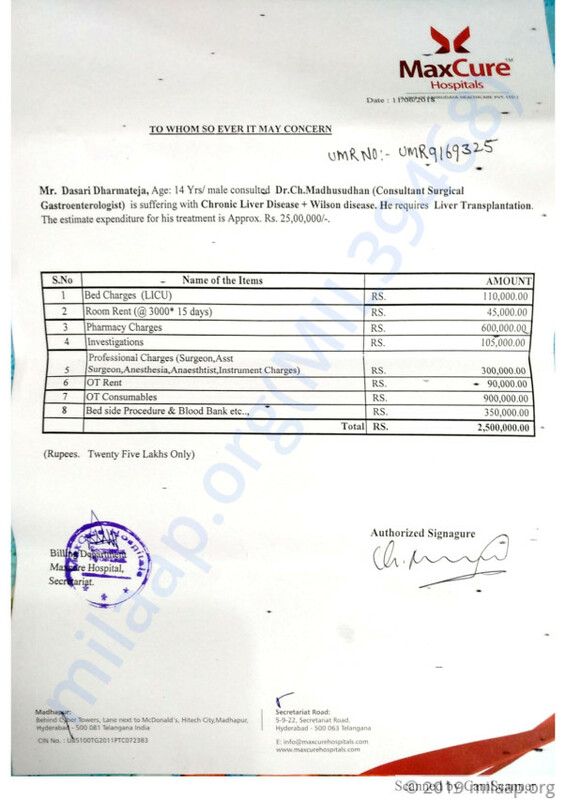 Doctors informed her that he has liver disease and would need 'banding' procedure to prevent bleeding, but it costed Rs 20,000. She couldn't afford it and was forced to bring him back home. "I did not understand anything but I knew he is in danger. I was struggling to feed my children everyday, how can I arrange for Rs 20,000? So with a heavy heart I came back but I took him to several other hospitals. Just looking at us they knew that we couldn't afford it. They simply gave us medicines. I thought he will be fine but now his condition is beyond I could imagine. Only a liver transplant can save him. His disease is killing him slowly." - Devi. Dasari is diagnosed with a chronic liver disease. He also suffers from Wilson's disease which means he has excessive deposition of copper in his liver and other tissues. This makes it very difficult for the liver to function. He has become very weak and tired. He lost his weight drastically. When he started to throw up blood his condition became critical. Doctors could no longer wait, they started treatment. He has now banding over his abdomen, but he still bleeds profusely. "Swelling has not reduced, he looks very pale. I can't bear the thought of losing him. He knew about the disease much better than me. He has not complained about anything, despite holding back my tears I sometimes break into ears in his presence, he also cries. He consoles me. He says he feels sad to see me crying." - Devi. 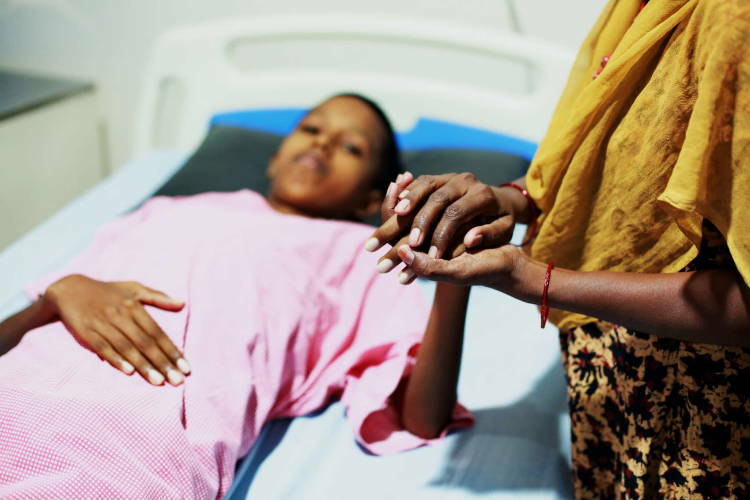 Devi never had an easy life, even before Dasari's diagnosis her battle for life started. She was attacked by polio and has a lump on her leg. She can't walk for long. When Dasari was born within few months her husband left her and married another woman. Since then, her life became a battlefield and she has had to fight all the odds single-handedly. "He grew up without his father, he feels bad that he doesn't have a father like his friends but he hates his father. He hates him for leaving us all alone. He always tells me that he will grow up and take care of me and his sister. He has always been a very understanding child. I don't understand how fate can be cruel to him." - Devi. Devi works as a salesperson in a small shop. She gets unbearable pain in her legs if she stands for a long time but this is her only source of income. Her daughter 17-year-old Gayathri is in her grandmother's house. Devi doesn't want her to feel any pressure, she is already disturbed because of her brother's health condition. Devi runs back and forth to hospital and job and she has unfathomable guilt and pain because she cannot afford her son's treatment. 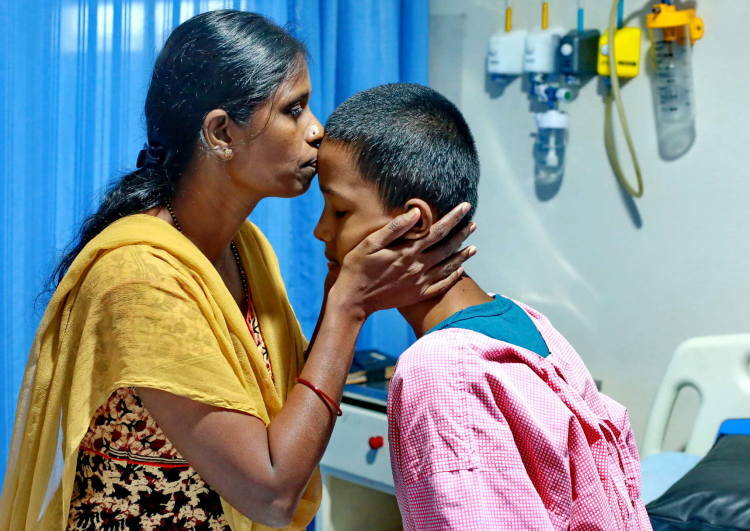 Devi, single mother and sole breadwinner of the family is struggling to save her son Dasari from the cruel and painful disease. Liver transplant is the only solution for him to survive. Devi has so far fought everything single-handedly and raised her two children. Now she is on the verge of losing one of her children. She earns Rs 5000 per month. While she is struggling for the next meal, a liver transplant is beyond her means. She needs Rs 25 lakhs for the transplant. Only your support can save her son. 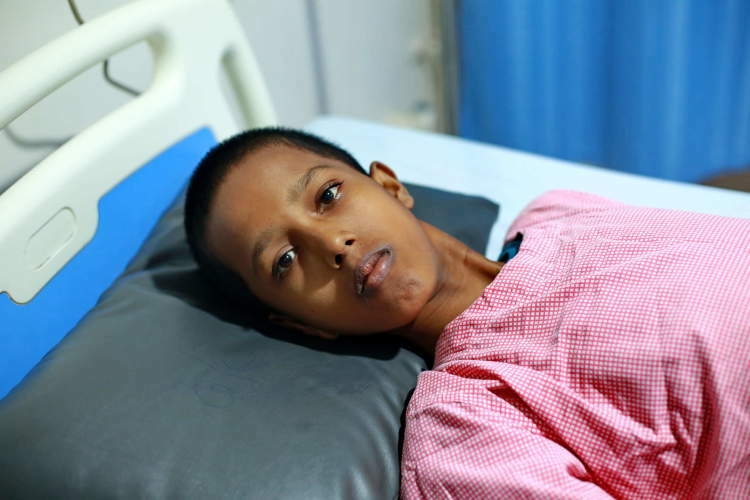 Your kind contribution can help this single mother to save her son from the cruel disease and give him a chance to live his life! Thank you for the wonderful support that you have shown towards Dasari. He had developed a few complications after the transplant procedure. The doctors were treating him and he was showing a positive response towards the treatment. He developed an infection due to which his blood vessels to the liver started thickening and this prevented the nutrients from passing to and fro from the liver. The doctors were administering him medication but he was not responding to it. His organs started failing and the doctors could not revive him. Thank you once again for the wonderful support. The funds raised via this campaign have been used towards his treatment. Please do pray for his soul to rest in peace. Thank you so much for the support you have shown towards Dasari and his mother. 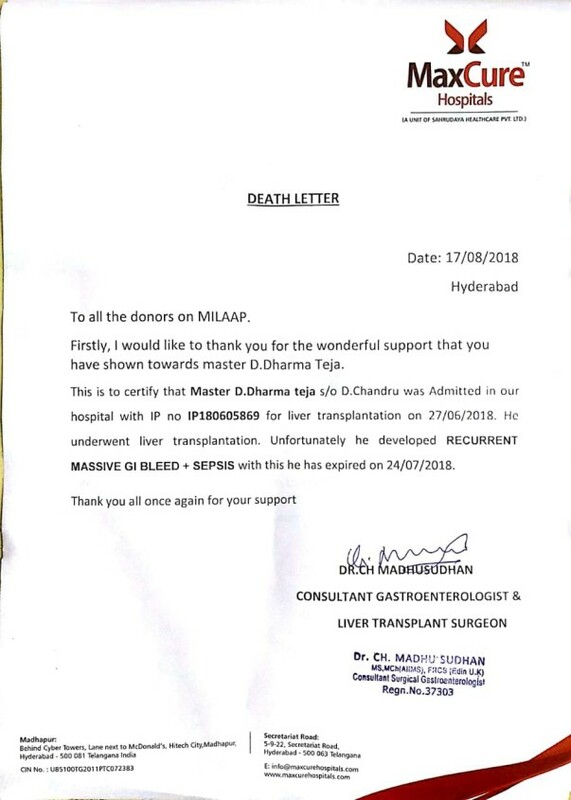 Dasari underwent the transplant on the 30th of June. 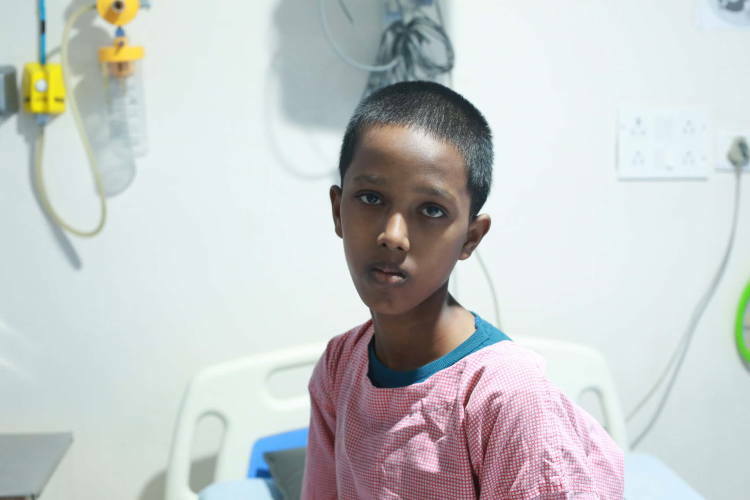 Due to the multiple complexities initially the kid has got into some serious condition on 1st July, but later-on with the efforts of the doctors the complexities have been gradually reduced. The health condition of the kid is being stabilised and for now both the donor and the receiver's condition is stable. Thank you for the support you have shown towards Dasari. Yesterday the kid has been admitted into the hospital for Liver Transplant. The kid and the mother (donar) has undergone the required tests. 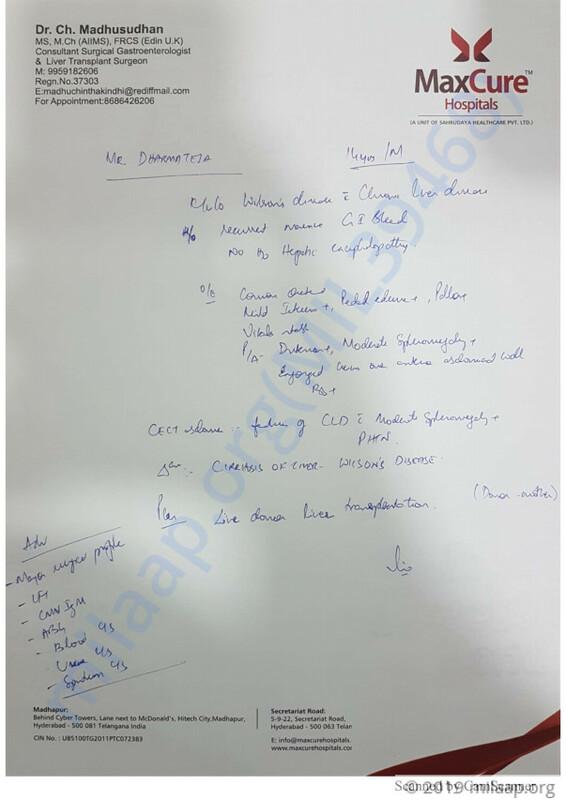 The paperwork for Liver Transplant has also been done. The kid might likely to undergo Transplant tomorrow or day after tomorrow. We will keep you posted further.